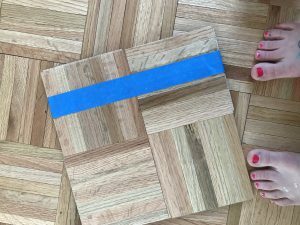 Parquet in a Day! - Brick & Banister Real Estate Co.
Our flooring adventure continues! 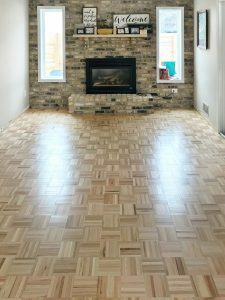 We are now completely done with the beautiful hickory floors upstairs, and I just wrapped up the last of the parquet in our fireplace room. Maybe you don’t remember, but I parquet-ed our front room and dining room last year. 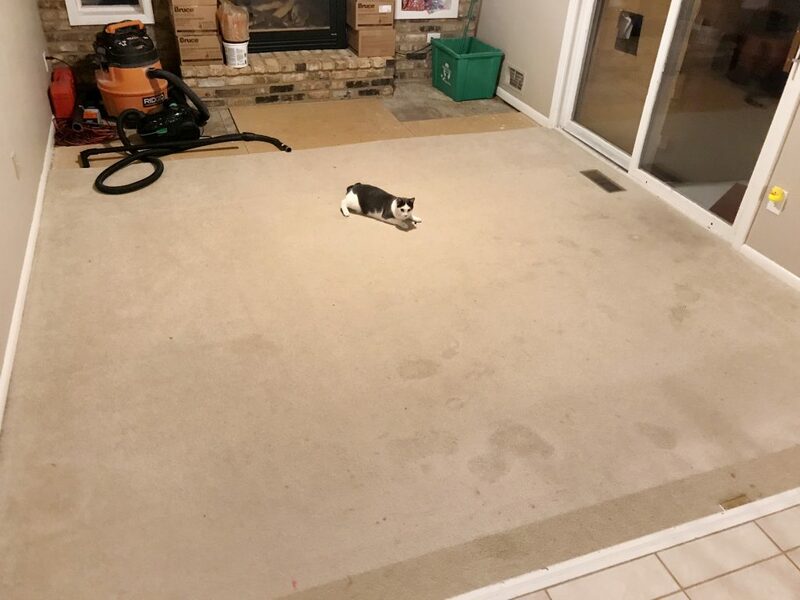 We are now a carpet-free house! We’ve got all new subflooring throughout except for under the tile which I can’t wait to take a sledgehammer to. The new subflooring is an extra step but well worth it in my opinion. 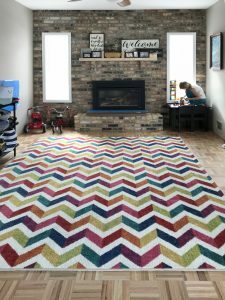 We had a squeaky house before, and not the old-house-character kind of squeaky floors; we had the end-of-its-life-crumbling-particle-board kind of squeaky floors. So we (royal we, my dear husband did the hard work on this project! I’ve been busy helping our amazing new agents get rolling!) tore all of the old stuff out and laid down new plywood. We used like 5lbs. of screws in each room, screwing into the floor joists every 14” or so. Now, when you walk around it feels noticeably sturdy and sound. So anyway, let’s get on with it. Notice how yucky that white carpet had gotten! Totally matted and lots of stains from kitties and kiddos. Under the carpet was the aforementioned crumbly subfloor. Over the years there has been a lot of patching, probably due to plants or pet stains. The patches were done in OSB that was a different thickness so we had a lot of unevenness. Under that was ½” plywood that’s pretty weak and thin. 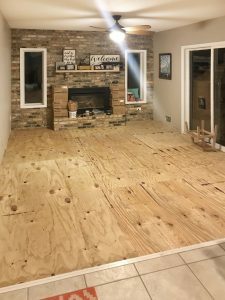 We put down new ¾” plywood with screws. At this point, I need to give a shoutout to my super amazing dumpster guy, Vern. I’ve shopped for dumpsters a lot over the years and you can’t beat Vern’s service or price. He’s a nice guy with a good biz. He has weird little trailer dumpsters (not the normal roll-off kind) that hold a bunch and his price is GREAT. Check him out. We ended up with two of them during this big project, but mostly because we kept the first one too long—life happened and our project got back burnered for a few weeks in the middle. So it goes. Okay, so here’s how you install this stuff. 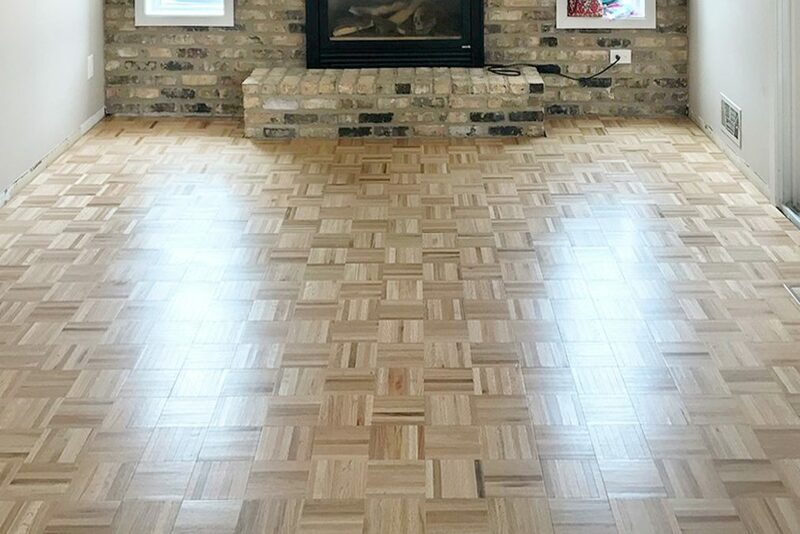 This installation would work well for any type of glue down engineered flooring like engineered hardwood or plank vinyl. First. Vacuum the area. It’s a huge bummer to get chunks of grossness stuck in your glue. Second. Mis en place. This is from cooking, everything in its place. Get your shiz together before you start so you don’t end up with glue all over the house as you scramble to grab that thing you needed from downstairs or whatever. A notched trowel for spreading glue, get one with appropriately sized notches based on flooring manufacturer’s recommendations. For my parquet, I needed tiny notches. Some kind of scoop to get the glue out of the bucket, I got a 3” plastic putty knife that I wouldn’t mind tossing when the project was done. A chop saw or appropriate cutter for the material you’re using. Last time I did this, it was outside so the project took a lot longer just running back and forth to the saw. This time I had the saw just far enough away that I wouldn’t get sawdust in my glue. It went much quicker! Parquet is a bummer because it has theselittle metal wires holding the little strips together, you really need a fine tooth saw blade so you don’t eff up the boards while cutting. If you hit that wire just right, you’ve got to start again. I used blue tape to hold the boards together while cutting. More on that later. Third. Make a plan. I started at the center on the far end of the room, so as not to ‘paint myself into a corner’. I like starting in the center (mostly because my Dad told me to the first time I did something like this) because then all of the cut tiles are on both edges, so the main part of the room looks really nice and full. We snapped a chalk line in both directions (like a crosshairs) so I had a guide to get started. Once the full first row is in place (making sure to keep it on the line!) it’s easy to keep things straight. Take the extra time at the beginning and the whole project will go better. Fourth. Get to work. Scoop out some glue and spread it on the floor with the notched trowel. Then start laying your tiles, making sure to keep them on the line. 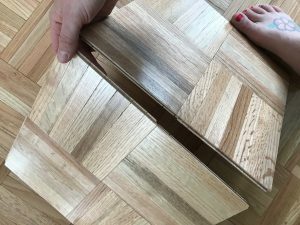 Parquet is tongue and grooved so it only goes down one way. The tiles snap into each other just so. Start with a relatively small area. For me, the first strip took the longest because there were so many cut tiles. You need to only put down as much glue as you can install before it starts drying, you’ll see in the video that once I got going, I could do a strip of two tiles deep all the way across the room in one glue spreading, but at the beginning, I was only laying down maybe 4 tiles before glueing the next section. You’ll get the hang of it. If you’re going slower than anticipated, make sure you remove any glue you can’t get to BEFORE IT DRIES! Especially in and around the tongue and groove areas or you’ll be using all of your swear words when you get back to working in that area. Last time I did this, I didn’t have enough time to do it all in one go and there are a lot more seams and noticeable spaces. This time, I set aside the whole day to complete the project and the floor looks BEAUTIFUL! I also used a story stick, a piece of wood cut to the size I need to leave as a margin around the room to use as a guide for measuring. This made the measuring and cutting part MUCH easier and will ensure my trim covers that gap whenever I get around to installing it. And now, for your viewing pleasure, here is me and my day of flooring. The video is only a few mins, but the entire project took about 6.5 hours! We still need to do trim, but I’m also planning to paint this room so I’ll wait until then to trim it out. Parquet costs about $4 a foot so this project was about $700 for flooring, another $100 or so in glue, and $250 for subfloor and screws. Not to mention a day of my time and a day of my husband’s time. All in, a very worthwhile project with a super enjoyable result. I’ve got my favorite unicorn rug laid down and a shelf for the toys. The kiddos love having this furniture free space to do their wild child thing. 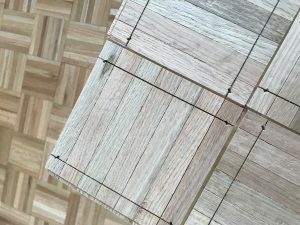 What do you think of the parquet? I’d love to hear your thoughts, it seems like people are a about 50/50 like/dislike. It’s an older style, but since my house is 1979, it seems to feel like the right kind of flooring.